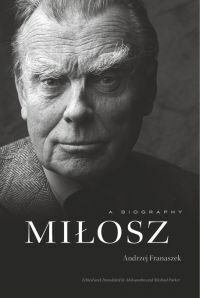 Andrzej Franaszek’s award-winning biography of Czeslaw Miłosz — the great Polish poet and winner of the Nobel Prize in Literature in 1980 — offers a rich portrait of the writer and his troubled century, providing context for a larger appreciation of his work. This English-language edition, translated by Aleksandra Parker and Michael Parker, contains a new introduction by the translators, along with historical explanations, maps, and a chronology. Franaszek recounts the poet’s personal odyssey through the events that convulsed twentieth-century Europe: World War I, the Bolshevik revolution, the Nazi invasion and occupation of Poland, and the Soviet Union’s postwar dominance of Eastern Europe. He follows the footsteps of a perpetual outsider who spent much of his unsettled life in Lithuania, Poland, and France, where he sought political asylum. From 1960 to 1999, Miłosz lived in the United States before returning to Poland, where he died in 2004. Franaszek traces Miłosz’s changing, constantly questioning, often skeptical attitude toward organized religion. In the long term, he concluded that faith performed a positive role, not least as an antidote to the amoral, soulless materialism that afflicts contemporary civilization. Despite years of hardship, alienation, and neglect, Miłosz retained a belief in the transformative power of poetry, particularly its capacity to serve as a source of moral resistance and a reservoir of collective hope. Seamus Heaney once said that Miłosz’s poetry is irradiated by wisdom. Miłosz reveals how that wisdom was tempered by experience even as the poet retained a childlike wonder in a misbegotten world. Nałkowska collected money for writers. which Miłosz helped distribute. – Miłosz’s relationshps with women – his misogeny, especially to older women. As he ages, he treats women badly, and continues to have sexual relationships with younger women. When a young man he makes Jadwiga pregnant, and leaves her in a position where she must have an abortion. On the other hand at least twice when asked to choose between his wife and his mistress (Jeanne Hersch, Ewa) he chooses to stay with his wife. – How did he live to be 92, after working for years in a smoke-filled study? He didn’t drink heavily, unlike Herbert. – He frequented brothels as a young man in Wilno, in a matter-of-fact way – not unusual among his peers. – Other diplomats defected after WW2, including Marcel Reich-Ranicki, who became an influential literary critic in West Germany. – Are we discussing the book, or judging the character of Miłosz? – His greatness as a poet linked to his ability to articulate and to connect personal experiences and broader historical forces. – His powerful intellect, and breadth of historical and literary knowledge, reflected in the range of his writings. – His biography offers a refreshing way of reading the history of Poland, including the distance between pre- and post-WW2 emigrés. He managed to sustain his talents through all the upheavals he endured, and closed the circle as it were in Krakow at the end of his life. – Was he Polish or Lithuanian? – In the 1990s a link between Vilnius and Edinburgh was established, but Vilnius didn’t sustain it. The new authorities replaced Polish street names with Lithuanian ones. – His work became popular in the USA in the 1980s, whereas before he had been little known, certainly as a poet. – Many figures appear in the book, and are given little context, so it can be hard remembering who is who. – Miłosz’s dislike for e.g. the work of Larkin later mellows into something like admiration; a recurrent pattern in his life, as what might be seen as his arrogance softens, something he himself acknowledges. – A series of displacements, geographical, cultural, linguistic: Lithuania, Poland, France, USA… He has an inferiority complex, describing himself, especially in France, as a barbarian. – He dismissed his wife Janka’s intellect, and demeaned her role; on the other hand she saw her role as supporting the great poet she believed him to be. He is driven and selfish… but when in Berkeley he has a visitor, it’s Janka who pushes him to get back to work. – His relationship with the Pope, including private audiences – they share a common language, having lived through the same historical events. Walęsa as the third member of this group, who become unexpectedly influential. A moment, around 1980, when Poland stands centrally on the world stage. A time when Polish workers could quote poems by Miłosz. – Interesting to see the extent of leftist activity in Poland between the wars. – What is the current Polish government’s attitude to Miłosz? Herbert is a poet they can assimilate more easily. Miłosz chose survival over politics, and over over a broader readership in the 1950s, 60s and 70s after he defected. Putrament is an interesting character, who becomes a cultural Stalinist, though he helps Miłosz defect. – The Pope attacked communism, but didn’t support capitalism, something Reagan couldn’t understand. Turowicz’s Tygonik Powszechny was the only independent publication in the communist block, and offered alternative publishing possibilities for writers. It was seen as the ‘voice of reason’, though as a Catholic publication it has since shifted to the right. – Miłosz in Berkeley in the 1960s; they wanted him, and gave him tenure very quickly, untypically. Berkeley was at the time at the centre of new thinking about urbanism and globalisation. – His broad education meant he was able to lecture on a range of subjects. – The depth of Franaszek’s research is admirable. – Beyond his work, Miłosz goes on family holidays, and camping trips with one or other of his sons. Janka’s loyalty, which she pays a price for; her isolation in the early ’50s, spending 3 years on her own, when she refuses to join him in France, fearful of a Soviet-led invasion. – Miłosz’s poor relationship with his own father; aged 17 he was left alone in Wilno when the rest of his family moved away. He wasn’t an outstanding pupil at school, though as a poet he was noticed early. – His and Janka’s publishing activities during the war, when they produced home-made books – the importance of (underground) literature and reading at the time. – Too big a book to discuss easily – better to do a chapter or two at a time.